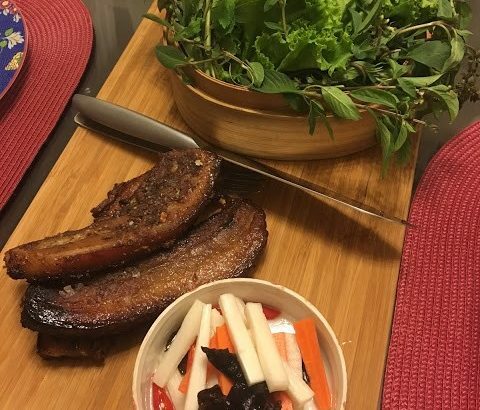 Try out Chef Linda’s Tamarind Pork Recipe! This dish is not to be confused with Babi Assam which is the braised pork in tamarind sauce. This, however, is the dry version! This recipe is simple! Simply combine the marinate and then rub it into the pork belly and set overnight in the fridge and then you’re ready to go! The pork belly becomes succulent and tender; simply irresistible with those charred edges. 1 tablespoon coriander powder, roasted. Cut belly pork into thick stripes, combine with the marinade and place pork in the fridge overnight. Simmer pork in marinade over low heat till cook. Remove pork and place it in the oven (200c) till brown or the edges charred. Brush the pork with the marinade. Sliced up into thick pieces and serve with garlic chili sauce.